In The King and I, Anna puts these questions to herself, but also to the King of Siam, who watches her. She has come to Siam to teach his children, but now finds her feelings toward him confused. How do you get to know a man better? You dance with him. And she does. The King, who observes her with interest, begins to find that he shares her confused feelings. A critical moment occurs when he insists that they dance like Westerners, with his hand around her waist. To see the delightful scene from the 1956 film, with Deborah Kerr and Yul Brynner, click here. 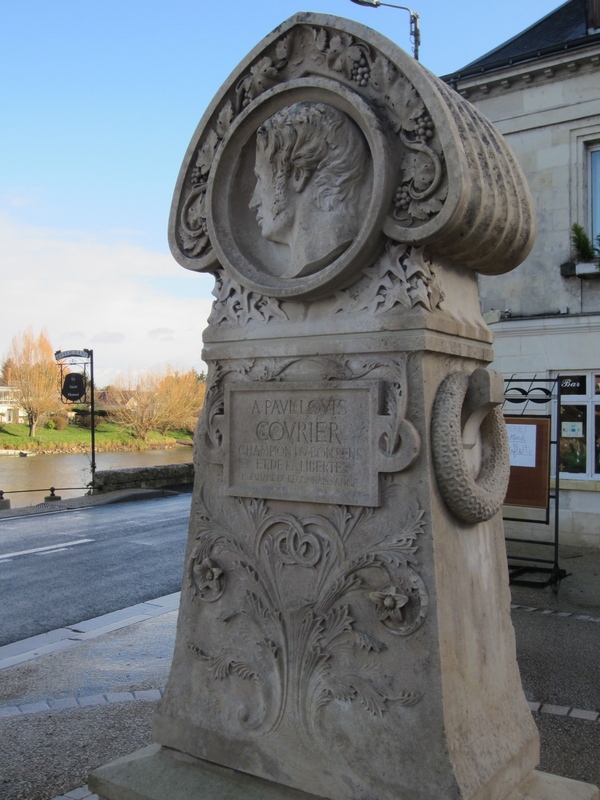 Paul-Louis Courier, who lived at la Chavonnière in Véretz, understood the profound social importance of dance in his society, and he protested strongly in 1822 when the priest in Azay-sur-Cher forbade dancing in the public square around the church. We will learn his fascinating story after a small bit of biking. Last we week ended our post on the bank of the Cher River at the Chateau de Beauvais, the site of the kidnapping in 1800 of Clement de Ris. Today we will bike from the chateau to Véretz, also on the Cher; to see our route click here. As we head east we approach the bridge over the Cher at Azay-sur-Cher. On the previous post we saw the view from the bridge toward the west; had we turned around on the bridge, we would have had the view below. 1. 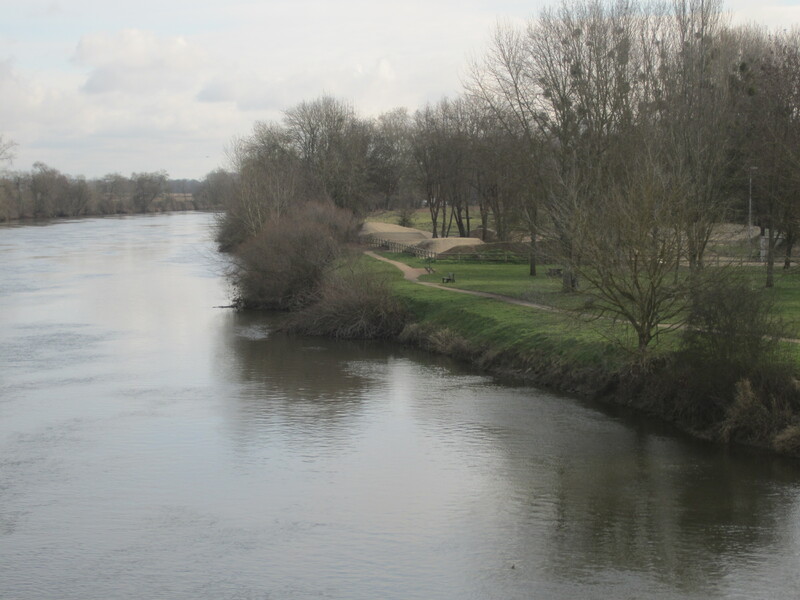 The Cher River at Azay-sur-Cher, looking east. In the upper right of the photo is a BMX (bicross in French) racing track. Heading west from the Chateau de Beauvais we reach this BMX track; a sign says it was set up by the French Federation of Cycling (Féderation Française de Cyclism). BMX followed motorcross, or off-road motor cycle racing (the cross comes from cross country running). Motorcross grew in the 20th century alongside stunt motor cycling: remember Steve McQueen in The Great Escape, or Evel Knieval, who broke 433 bones (a Guinness record) jumping over barrels and canyons. Kids watching this stuff on television began doing tricks on their bicycles, and eventually BMX (bicycle motorcross) was born. The picture below shows 7 of the mandatory 8 lanes at the start of the race (just like a running track). Part of the metal grill in the lower left is initially vertical; it drops to begin the race. The bumps and curves in the dirt track make for an exciting race. In the background is the Cher River. 2. 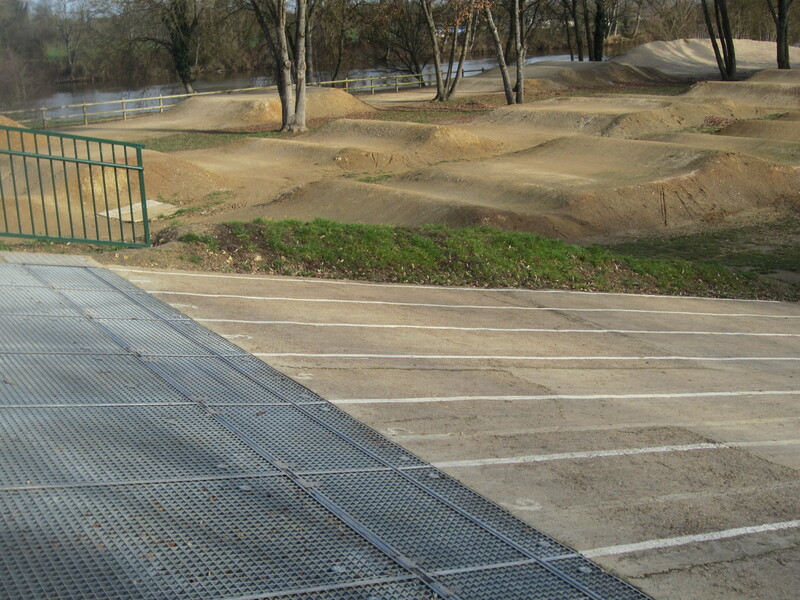 BMX racing track at Azay-sur-Cher. BMX appeared at the Olympics for the first time in 2008, with the French winning Gold and Silver in the women’s event, and finishing 8th in the men’s event (a Latvian man won the Gold, with Americans taking Silver and Bronze). It is an extreme sport, with thrills and spills. 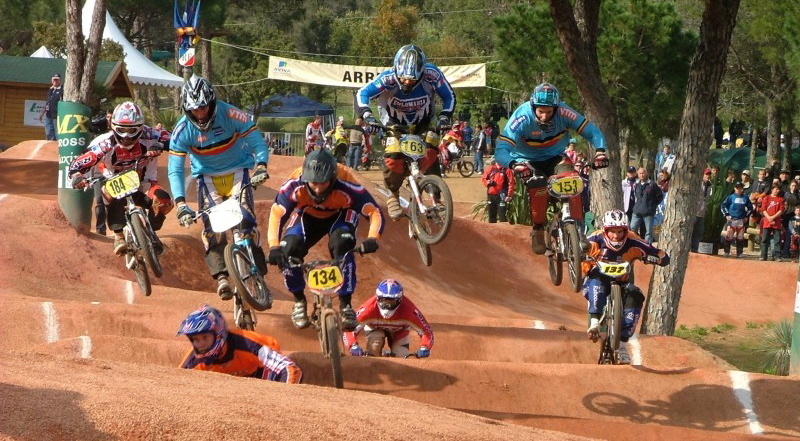 The picture below is from the 2005 European BMX Championships in Sainte-Maxime on the French Riviera. The eight cyclists are clearly visible. 3. 2005 European BMX Championships. Returning west to the bridge over the Cher, we head south up the hill to the center of Azay-sur-Cher, where we turn east on la rue de la Poste and bike to the town cemetery. We conclude our story of A Kidnapping at the Chateau by visiting the Clément de Ris family monument, the rectangular monument shown below, with an inscription which begins: “A la mémoire de la famille Clément de Ris.” We then return west on la rue de la Poste to the Eglise Sainte Marie-Madeleine in the center of town, where in 1822 the new priest forbade dancing on Sunday afternoon on the public square. 4. Monument to the family of Clément de Ris in the Azay-sur-Cher cemetery. The French Revolution of 1789 raised high hopes for ordinary people in the country. The oppressive Ancien Régime of privileged nobles supported by a politically powerful Catholic Church was to be swept away, replaced by a republic with democratic institutions and liberty, equality, and fraternity for all. Over the following century the transition to democracy was largely made, but it was slow going, with many fits and starts. We saw in our last post, A Kidnapping at the Chateau, that the justice system could be horribly corrupt a decade after the revolution. Paul-Louis Courier was born in Paris in 1772. His parents soon moved to Touraine. He was an ardent student and became well known for his expertise in Greek language and literature. He served for 17 years (1792-1809) in Artillery in the army. He married Herminie Clavier in 1814, bought the Forest of Larçay in 1815, and moved to Véretz in 1818, where he died in 1825. In 1821 he attacked the proposed acquisition of the Chateau de Chambord by public subscription in a pamphlet entitled The Simple Statement of Paul Louis, winegrower at la Chavonnière. The towns of France were to vote on whether they should make a financial contribution toward the purchase of Chambord, so it could be given to the duc de Bordeaux, born the previous year, the Bourbon next in line for the throne and thus believed by royalists a strong candidate to be King one day. This was too much for Courier, who while comfortable himself, lived amongst small landowners and labourers who struggled to get by while paying what he saw as oppressive taxes to the national government. His Simple Statement was directed to the town council of Véretz, urging them to reject the subscription. But he clearly had a wider audience in mind: he denounced the corruption of the court and the government, and made a fine case in economics for land ownership by the cultivators themselves, which was necessarily limited when large tracts of land like Chambord were held in a single noble family and kept as forests for hunting rather than fields for farming. The duc de Bordeaux (who became le comte de Chambord in 1830 when the purchase of the chateau was concluded) was never King, but he came close. With the death of the duc d’Angoulême in 1844 the legitimist wing of the monarchists proclaimed him the rightful king, Henry V, but his rights were not recognized by the various French governments during the next two decades. After the disaster of the Franco-Prussian War (1870-71) and the fall of Emperor Napoleon III, the newly voted National Assembly of the Third Republic had a majority of Monarchists, and they sought to install Henry V in a constitutional monarchy. It all failed, however, because Henry V rejected the Tricolour flag of the Revolution (still the French flag today), and insisted that France return to the white flag of the monarchy. This was too much for many members of the National Assembly, and Henry V never ruled. Courier would have been delighted. In 1875 the Assembly voted new constitutional laws establishing a Chamber of Deputies, a Senate, and a President as head of state, and these three institutions continue to this day. Courier’s Simple Statement pamphlet was not well received by the authorities, who seized the document and brought him to trial on a charge of outrage to public and religious morals. He thereby became a celebrity among progressive thinkers in Paris, writing to Herminie: “The more they persecute me, the greater my standing among the public” (Plus on me persécutera, plus j’aurai l’estime publique). After the sentence was pronounced, the other great opponent of the abuses of the Restoration–poet, singer, and songwriter, Pierre-Jean de Béranger–agreed with Courier on the reputational value of imprisonment: “If I were M. Courier, I would not give up those two months of prison for 100,000 francs.” (A la place de M. Courier, je ne donnerais pas ces deux mois de prison pour cent mille francs). Courier was condemned to two months in jail and entered the Sainte-Pélagie prison in Paris on October 11, 1821. Upon his release, the vigneron de la Chavronnière continued to write more than farm, and to spend more time in Paris than in Véretz. He would act on the national stage until his death. In July, 1822, Courier published his “Petition for villagers who are prevented from dancing.” It was the excesses of the Restoration that infuriated him. Courier probably favored a constitutional monarchy as opposed to a republic, and was not disrespectful of the Catholic faith or individual religious belief. However, he wrote with passion and force against a monarchy surrounded by thousands of useless courtiers supported by heavy taxes on a struggling people, and against the massive intervention of the Church in civil life. 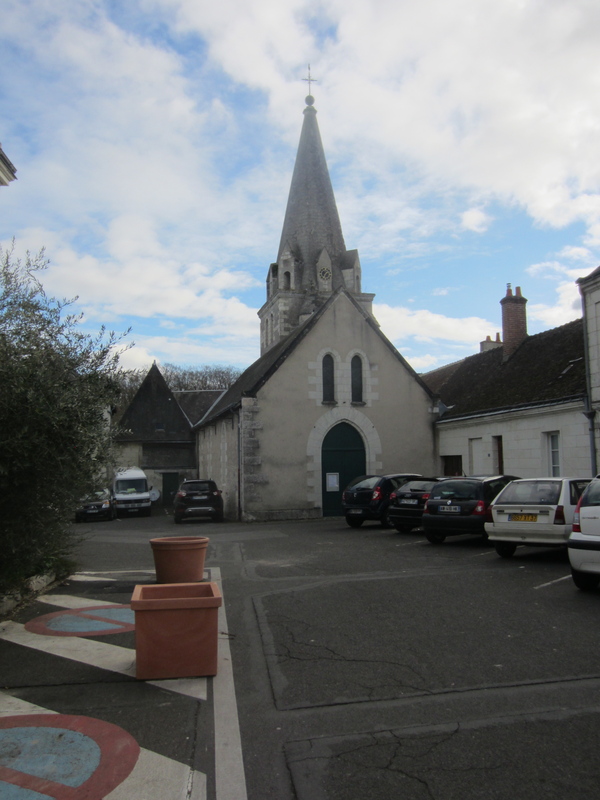 The case in question arose when a newly ordained priest arrived in 1821 in Azay-sur-Cher, and attempted, as he had been taught in the seminary of Tours, to impose the rules of the Ancien Regime. He sought the support of the Prefect, who agreed, and the people were forbidden to dance on Sunday afternoon in the public square near the church. The church still stands, with a small square around it on the east side, alas now largely filled with cars. The base of the steeple, the oldest part of the church, dates from the 12th century. The nave was rebuilt in 1790. The Chancel was renovated from 1850 to 1880; it has a lovely sculptured alter. 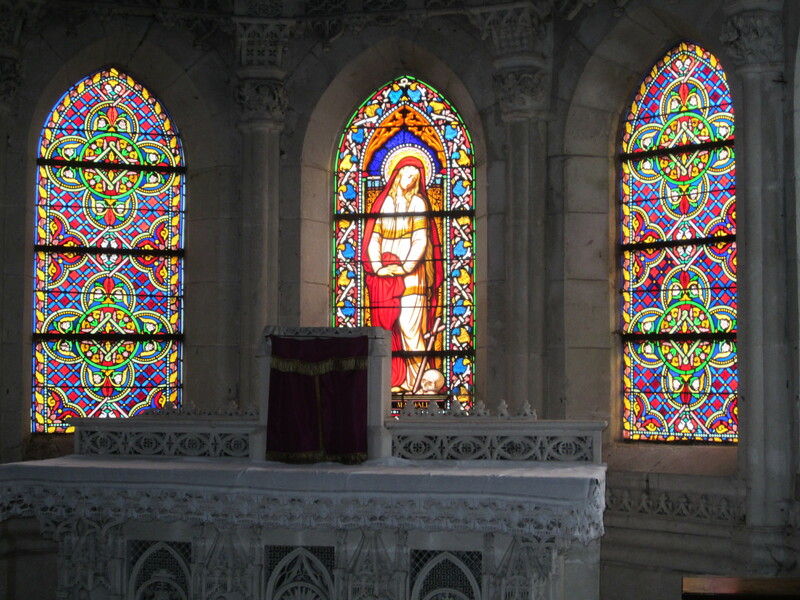 The central stained glass window is of Mairie-Madeleine. In the New Testament she is by far the most prominent of Jesus’ female followers; she was with Him at the Crucifixion and burial. She is often shown with a skull, as she is here. The skull may represent the inevitability of death and our need to prepare for it. 7. The Church of Saint Marie-Madeleine, seen from the east. This view of the church, from the east side, shows the massive base of the steeple, and two of the three windows in the Chancel in the previous photograph. There was room for dancing on this side of the church, too. The week after the pamphlet was issued, the police invaded Courier’s home at la Chavronnière and searched it, seizing copies of the offending document. While a pile of accusations were drawn up against him, this time he was found not guilty at the trial. 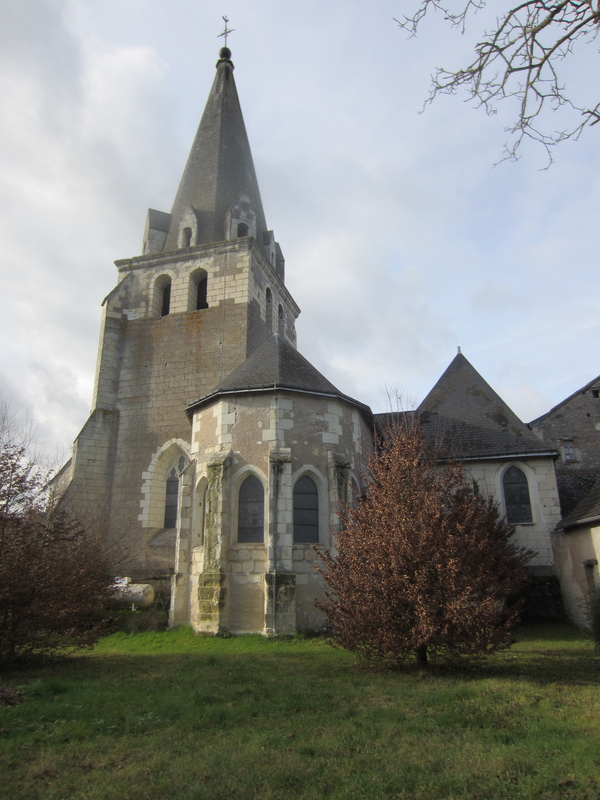 It is high time we got back on our bikes at the church in Azay-sur-Cher and headed off to Véretz. 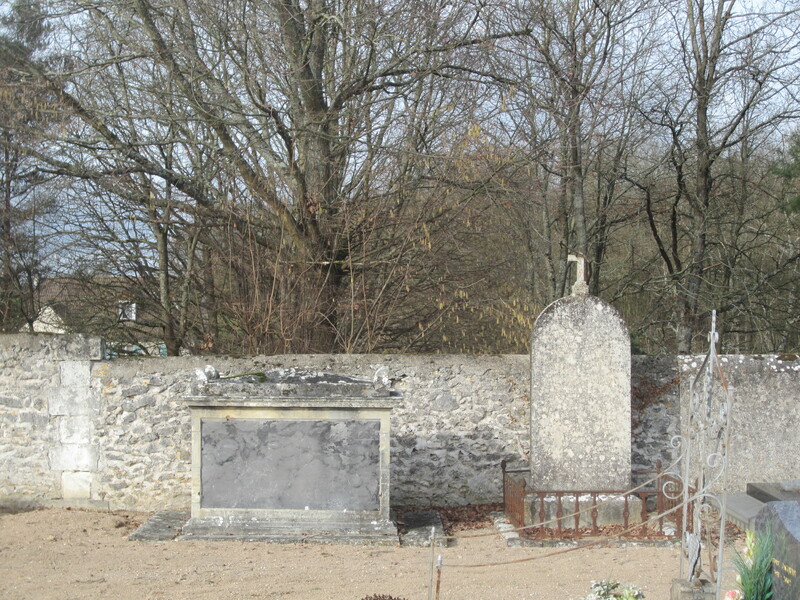 Our route takes us south and then northwest, to la Chavonnière, where Courier and his wife Herminie lived from 1818 until he was murdered in 1825, a crime which will be the subject of our next post. Our route takes us down to the Cher River and the old section of Véretz, with some fine old buildings on narrow streets. The one below is an example, with the church steeple visible in the background. 9. A home in old Véretz. On the left side of the photo is the Cher River. Just off the photo to the right was a boat which caught my eye. 11. A boat in the Cher River at Véretz. The boat has a large rudder and tiller; someone manning the tiller would need to look around the covered structure on the deck to see forward. The boat’s form reminded me of boats used for painting on rivers by two great 19th-century artists, Charles-François Daubigny (who called his boat le botin) and Claude Monet, who used his boat at Argenteuil in the 1870s. After Daubigny’s death in 1878, the city of Auvers-sur-Oise kept his boat for many years until it rotted. 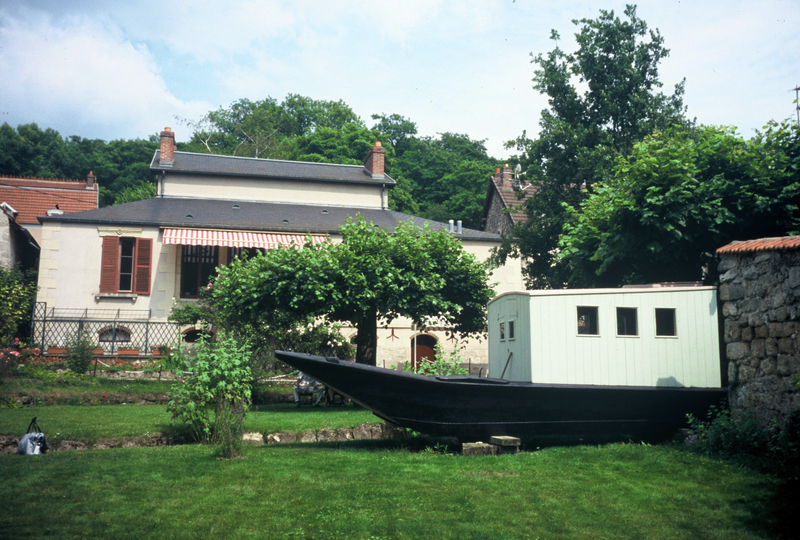 They then were able to arrange the loan of Monet’s boat from the city of Argenteuil, and displayed it at the Daubigny Museum in Auvers, where I was able to take a picture of it in 2004. 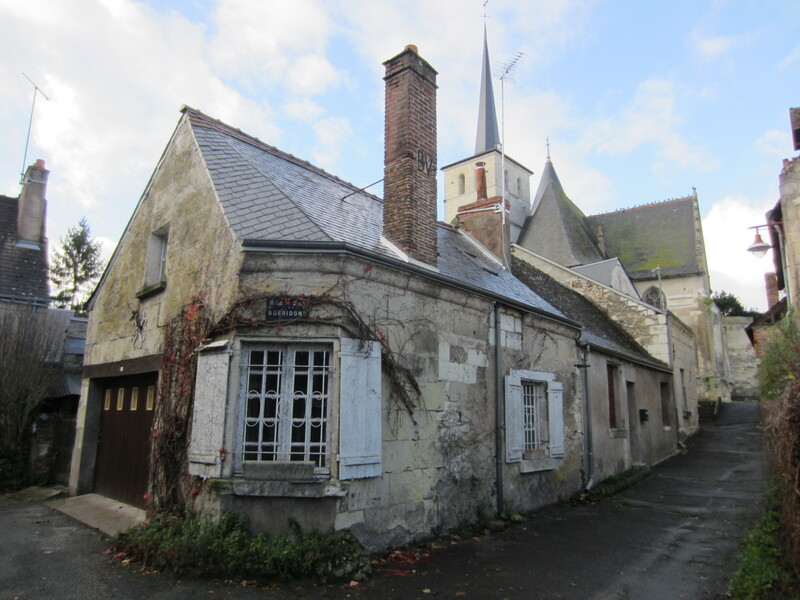 I visitied Auvers two years later and the boat was gone. 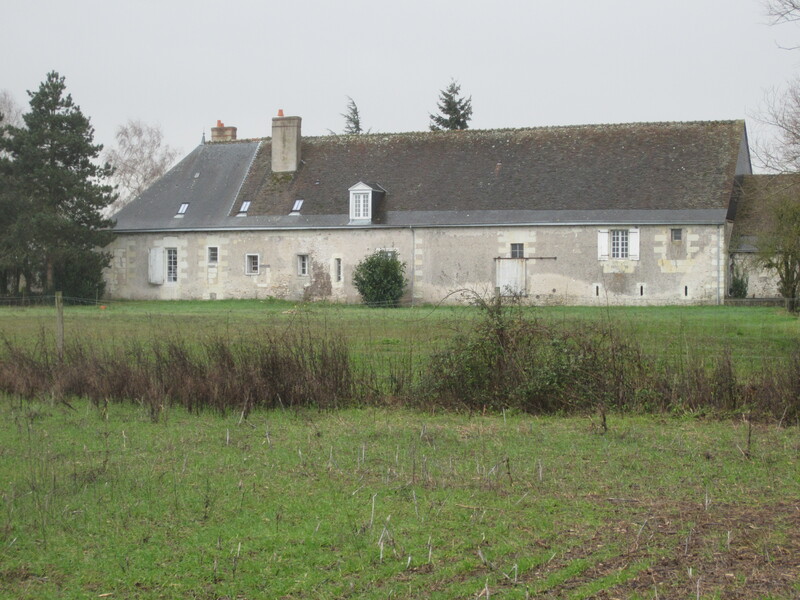 The Daubigny house and museum are privately owned by a married couple. The wife told me in July 2006 that the house had been in her husband’s family for some time. She said Monet’s boat had needed some repairs to protect it from the elements. 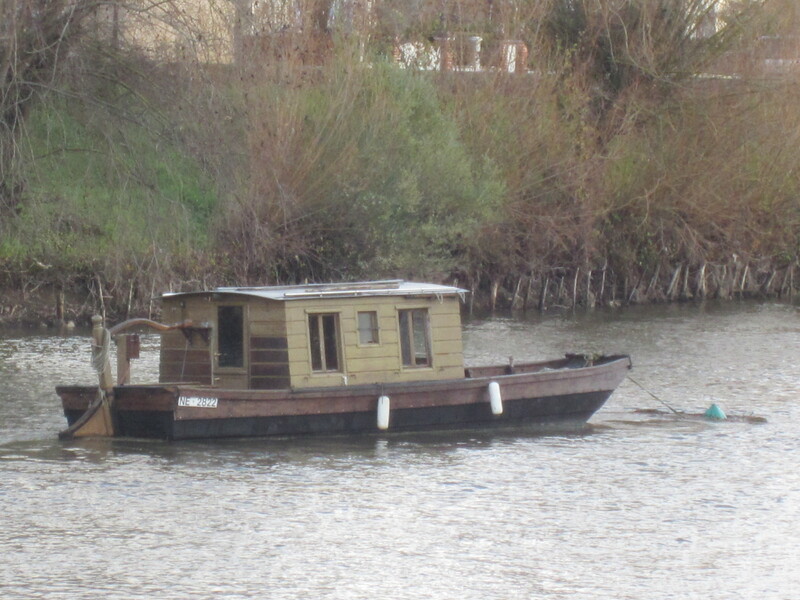 They had asked for financial help from the city of Argenteuil, which refused and took the boat back to put it in storage. She did not know where the boat was but believed it was not on public display. Photograph 3 is from the Wikimedia Commons, commons.wikimedia.org. All other photographs were taken by the author. “Justice, équité, providence ! vains mots dont on nous abuse ! Quelque part que je tourne les yeux, je ne vois que le crime triomphant, et l’innocence opprimée.” Pétition aux deux Chambres (1816). The full title was a lengthy one: Le Simple Discours de Paul Louis, vigneron de la Chavonniére, aux membres du Conseil de la Commune de Véretz, département d’Indre et Loire à l’occasion d’une souscription proposé par Son Excellence le Ministre de l’Intérieur pour l’acquistion de Chambord. A fascinating description of the affair is to be found in Jean-Pierre Lautman, Paul-Louis Courier, ou la plume indomptée (C.L.D., 2001), Partie IV, Chapitre 3, “L’opposant irréductible,” pp. 193-208. The quotations from Courier and Béranger are from this source. I have benefited greatly from a lengthy discussion with M. Lautman, who has devoted the last two decades to the study of Courier. See also Dejammet, pp. 426-432. Thirty-five years later, Baudelaire was taken to trial on the same charge for Les Fleurs de Mal. Paul-Louis Courier, “Pétition pour des villageois que l’on empêche de danser,” (Editeur l’Insomniaque, 2007), pp. 21-37. All citations from the petition are from this source. For examplse, Georges de la Tours (1593-1663) did four paintings of Marie-Madeleine, all with skulls. My favorite is the painting in the Louvre, Magdalen of Night Light, 1640-45, 128 x 94 cm.